What does the future hold for the world of beauty and personal care? What are the shopping experiences that matter most to millennial women? These questions are crucial to beauty retailers seeking to create seamless online purchase experiences or in-store shopping experiences that surprise and delight for a discerning audience responsible for nearly $500 million dollars in beauty purchases, according to Nielsen. 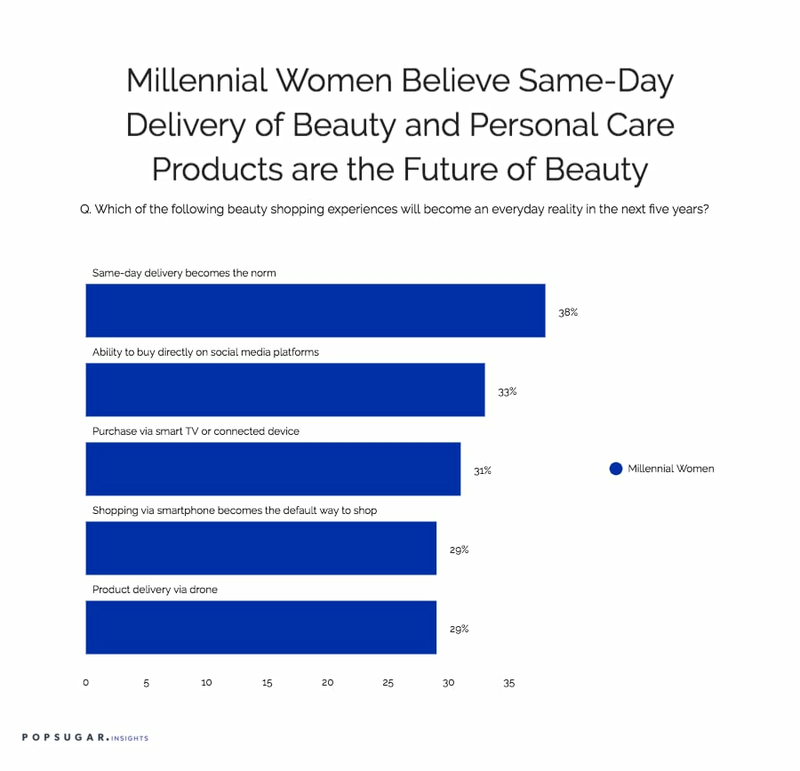 As part of the POPSUGAR Insights study "Beauty Evolved: How Millennial Women Shop for Beauty and Personal Care," we asked millennial women to tell us the beauty shopping experiences that they feel will become an everyday reality in the next five years and which beauty shopping experience is most important to them. Among millennial women, 38% believe that same-day delivery will be the norm for beauty and personal care purchases and 33% of millennial women believe that they'll have the ability to buy beauty products directly via social media platforms like Facebook, Instagram, or Snapchat. Over 30% of millennial women believe that they'll be able to make a beauty purchase directly via their smart TV or connected device, and 29% feel that shopping via smartphone will become the default way to shop for beauty products. In the true spirit of evolutionary retail experiences, 29% of millennial women believe that delivery of beauty products via drone will be available,and 26% feel that physical stores will offer more in-store events and curated experiences for shoppers, giving them a strong reason to head to their local store. When we asked millennial women to tell us the future beauty and personal care shopping experiences that they feel are most important to them, two choices rose to the top of the list. First, millennial women are huge fans of same-day delivery, showing that convenience is hugely important to the modern beauty shopper. Second, millennial women felt that it is important to them that physical stores selling beauty and personal care products evolve to offer more in-store events and experiences to attract shoppers. When we asked women to describe their ideal offline beauty and personal care shopping experience, the most popular responses were "easy/convenient," "fun/exciting," and "fast/quick," showing that convenience and providing an experience are important to millennial women.